Heat recovery systems can heat and cool spaces simultaneously. Hitachi SmartFlex™ VRF heat recovery systems offer an extended operating temperature range: outdoor ambient temperature as low as -10° F (-23° C) in the cooling mode with a low ambient kit and as low as -13° F (-26° C) in the heating mode. Single chassis units in 6, 8, 10, 12, 14 and 16 tons enable system designs with fewer units and system sizes up to 36 tons. Impressive operating ranges and high capacities at low and high ambient temperatures to meet diverse application requirements. Long refrigerant piping lengths provide design flexibility – up to 3,281 feet total pipe run and a vertical lift of 360 feet when the Outdoor Unit(s) is above the Indoor Unit(s) . 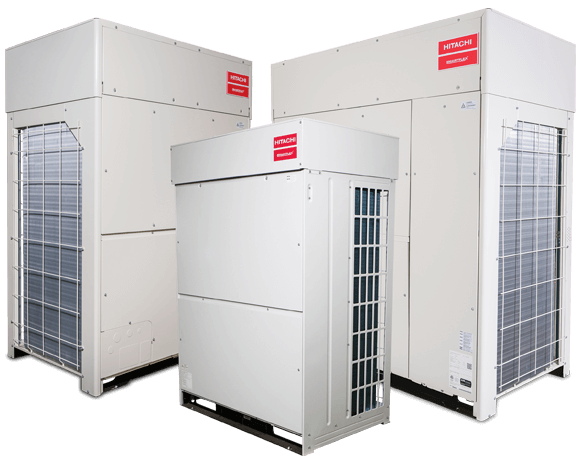 Redesigned inverter scroll compressors deliver optimum efficiency at partial load conditions. Dual inverter compressors are standard in 8, 10, 12, 14, and 16 ton units for increased efficiency. Connection ratios up to 150% provides more design options. Advanced defrost cycle operation in the heating mode. Power-saving demand control for reduced peak load and energy savings. Automatic judgement system for Refrigerant Amount to verify refrigerant charge is correct. Diagnostics and malfunction codes available at push of a control panel button.